There are so many trends going on this summer. If you’d like to see a “Makeup Trends: Summer 2016 ” post where I try out and review some of those trends, make sure to leave a comment with any trends you’d like to see! I absolutely love this mascara. It’s not clumpy, it’s easy to apply, and it makes my lashes #onfleek. This palette is perfect for summer. It has a great combination of different matte and shimmery shades and looks great on all skin tones. This amazing primer is infused with coconut water, probiotics, and skin revivers to “help replenish tired, depleted and overworked skin while locking down makeup for fresh and flawless wear”. You can wear this primer by itself for fresh, dewy skin or as a base for your makeup. Either way, it makes your skin look flawless. If you’ve been following along with my blog, you know how much I love this foundation. I’ve mentioned it in almost all my makeup related posts. 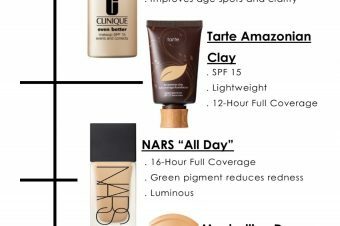 This lightweight, buildable, full coverage foundation is infused with Amazonian clay and helps you achieve flawless skin that looks healthy and natural, not cakey. I wear this foundation daily and it’s great for all sorts of skin types. This matte bronzer is perfect for all skin tones and gives revives your face with a soft warm glow. Everyone has been raving over this product and I have to say, I’ve joined the bandwagon. I know there are a lot of less expensive dupes but I love this highlighter and it truly is worth the price. Nothing is worse than your makeup melting off. After you get ready in the morning, set your makeup with this setting spray, and you’ll be good to until the end of the night. Enjoyed your post lots of great make up ideas!